Welcome to An Adventure in Small Games, a monthly series focused on games that cost less than $20, ideally less than $10. In this series Eve Golden Woods will focus on the indie game and what it has to offer the world of gaming. My original draft of this review, which thankfully exists only in my head, used the word charming approximately 77 times. And try as I might, I can come up with no better word to describe Dominique Pamplemousse than charming. It gets under your skin, making you smile from the moment it starts. 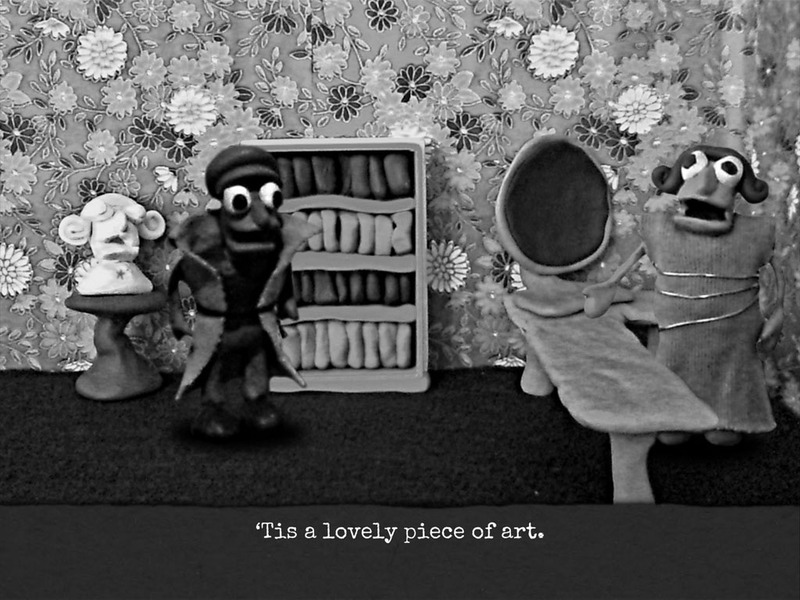 Everything about it, from the black and white Claymation to the faint speakeasy wheeze under the singing makes your lips twitch until you find yourself half a scene into the game and grinning from ear to ear. Dominique Pamplemousse, by Deirdre “Squinky” Kiai, was released in 2013, but it was only with its more recent release on Steam and itch.io that I played it. A Claymation noir musical might seem like an absurd concept for a game, but Dominique Pamplemousse pulls it off with panache. There’s a very deft mixture of humour and mystery that keeps the narrative moving, and the point-and-click element gives the player the time and space to engage with smaller character moments. The mechanics are simple and familiar but highly functional and accessible, and anyone who has played similar games will have no problem navigating this one. Narratively, perhaps the best way to think of Dominique Pamplemousse is to start with noir. Noir as a genre is characterized by a certain tone and by certain elements. It presents a cynical, ambiguous, and cruel perspective on a universe in which justice is not possible, or is only possible at a great cost. Noir stories are usually situated in a heavily patriarchal and misogynistic universe, which helps to reinforce the brutality and unfairness of the world. Noir is characterized by a powerless protagonist, someone who must contend with forces beyond their control, who is at the mercy of both their employer and their enemy. Dominique Pamplemousse plays with these conventions, abandoning some and highlighting others to serve its themes and atmosphere. 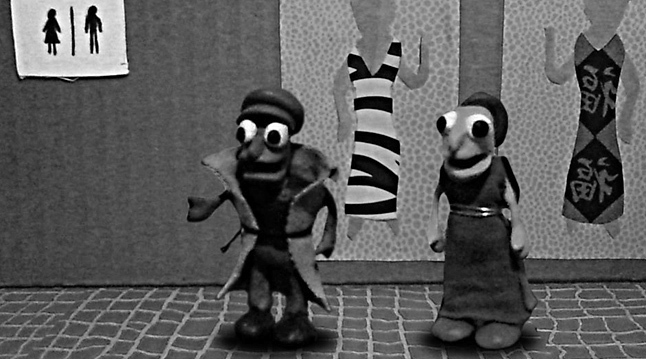 Some of the common themes of noir are blunted in Dominque Pamplemousse by the musical and Claymation elements. There is no fear that Dominique, the titular protagonist, will end up beaten in an alleyway, or left for dead in the rain; we are reassured by the gentle tone of the brass instrumentation and the blurry flickering record scratches, by the singing of the protagonist and the jokes that appear almost from the first line of dialogue. The brutal violence that is one common aspect of noir is totally absent here, and so the focus of the narrative is completely on the protagonist’s search for truth. Dominique has no gun: their only weapon is their investigative skills. This is not to say that the game lacks cynicism. While Dominique themselves might not evince the hardboiled attitude of a typical noir detective, the world around them is more than ready to suggest the worst. Capitalism and its accompanying woes are a major theme of the game. Dominque is poor and struggling with heavy student loans, living through a recession in an office with peeling wallpaper and no internet. Small touches, like the fact that their laptop has to be continuously plugged in because the battery no longer works, convey their abject poverty and sense of helplessness. Later in the game, as we learn more about Dominique’s past, it becomes clear that this is a world where institutional power uses up and spits out the young and struggling, where skill is not in any way a measure of success. Power is in every sense suspect, and those who have it cannot be trusted to use it well, as we see when the truth of the case finally emerges. The antagonist Of Dominique Pamplemousse may have power and authority, but they are motivated by greed, and by an insight into a world that is fundamentally unfair and refuses to protect or support them. Without spoiling anything, even the ending of the game reinforces this view. No matter which choice you make, you are presented with an imperfect resolution. The trials of the world cannot be completely conquered or defeated. Dominique must endure the vagrancies of uncaring reality. By now you will probably have noticed my continued use of they for Dominique. Gender is one of the most interesting aspects of Dominique Pamplemousse. The game contains six characters: four women, one man, and Dominique themselves, who is gender neutral. This is not only an extremely refreshing choice — it serves to help develop both the themes and the atmosphere of the game. Dominique’s gender is the subject of some excellent jokes – my favourite, seen in the trailer, is when a character directly asks if Dominique is male or female. “I’m a detective,” they reply. The creator of the game, Deirdre Kiai, also identifies as gender neutral, and one definitely gets the impression that some of the more frustrating conversations Dominique has with people in the game have real life parallels, but what really bring the character alive is the deft writing. The humour always places the reader firmly on Dominique’s side, so that we laugh with them rather than at them, amused by the stubborn determination of everyone else in the game to define Dominique against their wishes and without their permission. This latter aspect of Dominique’s gender, the act of definition, is also crucial to the more serious themes of the game. In Dominique Pamplemousse, everyone wears masks. All of the characters have at least one surprising reveal in them, and the person we think we see at the beginning is very different to the person we see at the end. In contrast, Dominique lacks the power of a visible mask – they are spoken for on the subject of gender, rather than spoken to. At several points in the game characters are confused by their gender presentation, but rather than asking for clarification they make assumptions and move on. Dominique’s disinterest in gender and the roles it demands of people is reflected by their answer to the joke above, “I’m a detective.” Rather than choosing one of two equally ill-fitting and unsuitable masks, Dominique chooses to wear the mask of their chosen profession, to define themselves by what they do rather than what they are. 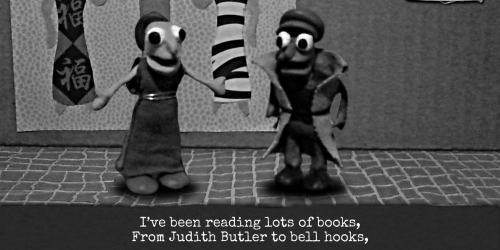 Dominique’s gender serves the humour and themes of the game, but it also has a wider relationship to the noir genre. Gender and noir is a complex issue. The femme fatale emerged in noir, and women in that genre tend to be firmly fixed in their roles, either as passive victims or malicious manipulators. Though they wield a certain kind of power, it is the restricted power of a woman struggling under patriarchy, and it is always power used in relation to the men in their lives: the power to defy those men, or the power to aid them. In contrast, the victim in Dominique Pamplemousse is the only male character, and all the other supporting roles, on every side of the conflict, are filled by women. This reversal allows the game, short as it is, to reflect a different set of gender dynamics than those usually found in noir, and to speak from a female and gender-neutral perspective on the conflicts women face under patriarchal systems. Devon von Damme is emblematic of this, appearing at first to be a typical teenager, crushing on a handsome singer and hanging out at the mall. Over the course of the game, however, it becomes clear that this is not all she is, and that in fact she has deliberately constructed much of her presentation as a shield. She ended up being my favourite of the supporting characters, and I think she is indicative of how good the writing for this game is. On yet another level, Dominique’s gender helps to reinforce one of the common conventions of noir, that of the powerless protagonist. In addition to the struggles Dominique faces as a poor person, under 30, with no career potential and very little in the way of a support network, their gender serves to deny them even the simple power of a protagonist who identifies more readily with male or female. The noir hero may be a man down on his luck, struggling against a world that has no use for him, but he still benefits from the power afforded men under partriarchy. Conversely the femme fatale may be a woman in a misogynistic world, but her sexuality gives her the ability to manipulate it to her own ends. This is where the elegance of the writing becomes most clear. The themes of the game play with the conventions of the noir genre, but noir itself also clarifies and develops these themes. By giving the game a noir setting, Deirdre Kiai illuminates and reinforces the dialogue around gender that happens within the narrative itself. Dominique Pamplemousse is not a perfect game. The voice acting and singing is a little rough, sometimes feeling slightly tinny or out of tune. And though the game is far too short to drag, a competent player will probably guess the major story twists about two scenes before they are revealed to Dominique. In spite of these flaws, however, I strongly recommend buying and playing this game. It’s clever, fun and daring, and it tries something completely new. It represents the work of a creator who developed it without studio intervention or executive meddling, and that shows in its clear themes and punchy narrative. It’s better than perfect: it’s utterly charming.